In early 2013, I didn't really know what to do with myself. The previous spring, I had been laid off from a high tech job, and in short order my mother was given a terminal cancer diagnosis, suffered through unsuccessful treatments and the loss of her independence, and passed away. If I had been looking for an excuse to rethink my career priorities, it hit me like a ton of bricks. Now is the time, I said to myself. As part of the process, I began to get in shape, a process that came to include cycling to a new gym in Richmond, of all places. I would bike 10km there, work out for about 45 minutes, and bike back. Difficult and satisfying. I also became aware of the dangers of cycling many of the streets in Vancouver and Richmond, some of them designated bike routes. Or, so I thought - as part of my routine, I discovered some signage gaps that seemed to lead cyclists down a bike-friendly route, only to place them in what i felt to be harm's way. Chagrinned, I did something I almost never do. I spoke out. Or posted out - I submitted a comment on the HUB Cycling Facebook page, and to be honest I have no idea how I found them, because I had not much of a clue about who they were and what they did. And nobody responded. So I wrote a rant on my blog, and posted it with the hopes that it might lead to some further inspiration on the subject of cycling in Vancouver. If you're a cyclist in Vancouver, you're starting to get used to little miracles, like being able to cycle safely across the Fraser River to Richmond, where we keep our airport, casino, and a really good Costco. The North Arm Bridge of the Canada Line, which crosses the Fraser River at Cambie Street and E Kent Avenue South, a legacy from the 2010 Olympics, now includes a cyclist and pedestrian bridge. Since it opened in 2009, it's developed a steady flow of foot and 2-wheeled traffic. Having cycled across the Knight, Oak and Granville bridges countless times and felt "there has to be a better way", it happened. It's a beauty, a single, wide path that switchbacks twice before sidling up next to (and just below) the bridge deck, where you can hear trains passing to and fro. The view of English Bay winking off into the Straight of Georgia frames some pretty nice sunsets. Even the tugs, pulling logs through grey mist on a cold day can be a defining moment on this bridge. But getting there is scary. The cycling route venturing south on Ontario Street and safely across Marine Drive, ostensibly leads a cyclist to the bridge. But it tapers off at 69th, and you join traffic on E Kent Avenue. There are a lot of fast cars on this shared roadway. And trucks. Lots and lots of trucks. The irony, of course, is that within six months I was working for HUB as their Director of Marketing, Communications & Campaigns. I think I referenced my experience trying to get to (and then surviving) East Kent during my interview with Erin O'Melinn, HUB's Executive Director. 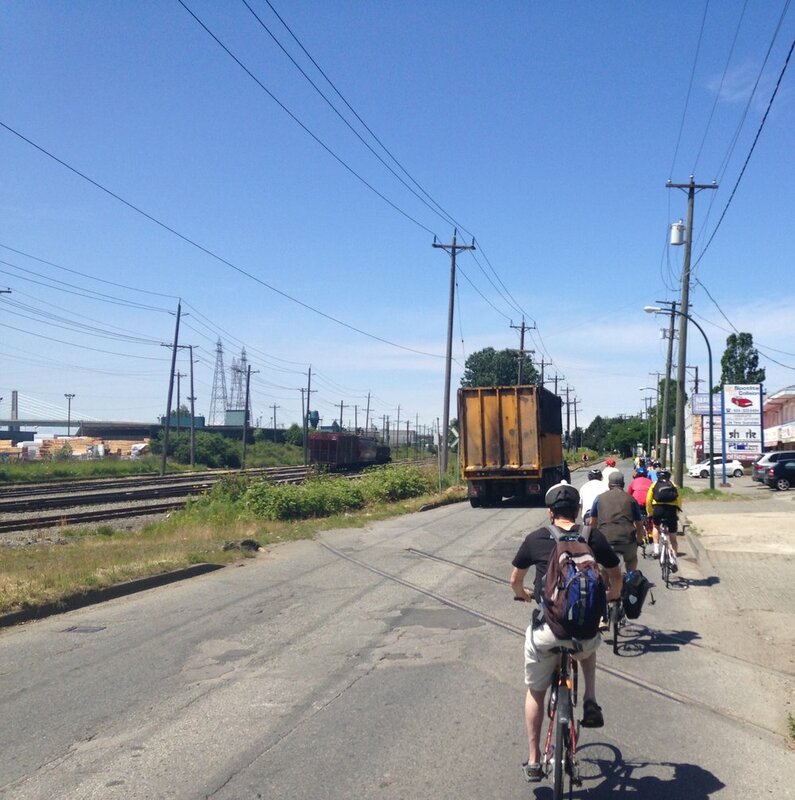 I certainly reflected on that prior experience when, as part of the 2014 HUB Cycling annual general meeting, I joined the President's Ride to the AGM, from Nat Bailey Stadium to BCIT's Richmond campus...following this very same route. It's a long stretch from Ontario Street to the crossing to the North Arm Bridge at Cambie Street, and there's a lot of gravel on the roadway, kicking back into cyclists, and sliding around under bicycle wheels as they spin along uneven roads. There's also a loss of room around the South Vancouver Transfer Station and landfill, where lane dividers and turning drivers increase the risk to cyclist safety. Actually, it's hell. Anyone trying to get to North Arm Bridge via Ontario Street on a windy day should have mirrors, life insurance, and an updated will. Alarmist, sure. But remember, alarms wake us up. Silence...silence can be deadly. As the group headed down Ontario to the separated lane that deceivingly beckons to cyclists, leading only from SE Marine Drive to 69th Avenue, I made a comment about how it was dangerous, and maybe we should try something different. The alternative route is to follow the shared roadway down Cambie Street to Kent - there are issues in doing so due to construction in the area, and buses turning in and out of a bus loop — but the danger is less so, unless you count the hazardous driving and abuse hurled upon cyclists by staff at Nextgen Technologies, the contractor managing the Kidd Substation tucked under the north end of the bridge. And this is not to mention what happens on the Richmond end, at River Road and Van Horne Way, in an attempt to go east. Go by foot, I say. We made it, of course, and in the end the Richmond side isn't as bad as I made it out to be. Still - and still to this day - it's a crummy part of Vancouver's erstwhile bike network. Shared and dedicated roadways alike are in bad need of new or re-established connections; "grid gaps", as one could call them, persist across the growing web of bike lanes in Vancouver. And one of these days, someone's going to get killed. I keep holding my breath when it comes to this stretch of E Kent. I hope it's dealt with soon.